I’ve been writing my first YA novel, and as much as I’ve enjoyed the process, it’s often felt like a death match. I’m like that guy on the garage floor, bloodied and short of breath, stretching for that just-out-of-reach crowbar. If only I could grasp it to smash my opponent, that damn story, across the skull. Anyway, my current book involves sixteen-year-old characters. I’m doing a lot of remembering, soul-searching. Again, not so much the specific details of that time but the essential feelings of that age. First summer jobs, first car, first love. 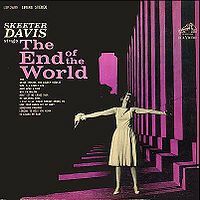 Somewhere along the line I remembered “The End of the World,” an amazing 1963 Skeeter Davis tune, produced by Chet Atkins, music by Arthur Kent and lyrics by Sylvia Dee. My goodness, what lyrics. Has any song better captured the heartbreak of teenage love? Absolute perfection. A song that could not possibly be better. ‘Cause you don’t love me any more? Don’t they know it’s the end of the world. Why everything’s the same as it was. How life goes on the way it does. It ended when you said goodbye.